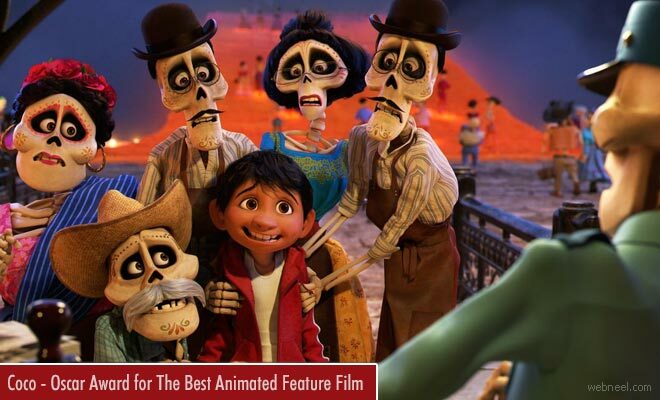 3D: Disney Pixar's 'Coco' - 3d Animation Feature Film is all set to become the winner in the race for Oscars. Currently atleast 27 out of 31 film critics have voted 'Coco' for the Best Animated Feature Film. If Disney's Coco wins the title this year, it will be the 10th successive win for the Walt Disney Company. Apart from Coco, these four animated feature films are in the race: Loving Vincent, The Lego Batman Movie, My Life as a Zucchini and The Breadwinner. Coco is a 2017, 3d animation movie which strongly revolves around music and the love for family. Miguel, the grand son of a great musician steals a guitar and he falls into the land of the dead, where he encounters his dead skeletal relatives. He has to return to the land of the living before sunrise, else he will turn up dead. It's quite a seat gripping story and the journey is quite detailed. Here is to hoping for the winner.